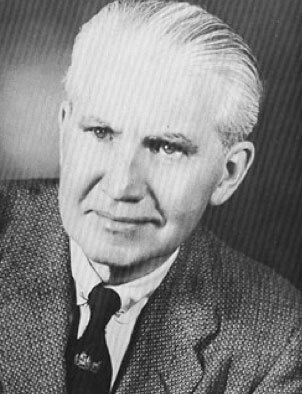 William Edmund Barrett was born in New York City on November 16, 1900. His parents, John and Eleanor Barrett, moved to Denver in 1916, where Bill graduated from Cathedral High School. Two years before moving to Colorado, Bill sold his first piece of writing, a poem, and was thus following in his father’s footsteps. He returned to his hometown to attend Manhattan College and graduated with a degree in engineering. He later admitted to earning money by writing papers for other students during his college years, and offering a money back guarantee if the student was not satisfied with the ghost written paper. He never had to refund any. In 1922, he was hired by the Denver Gas and Electric Light Company. A year later, Westinghouse Corporation hired him as a regional advertising director based in St. Louis. While working in St. Louis he met Christine Rollman and in February of 1925 they were secretly wed. In July of that year, Bill and “Bunny” (Christine) announced their marriage. In January of 1926 their first child, Marjorie, was born and a year later William Jr. In 1928, Barrett resigned his full-time position with Westinghouse, although he continued to write as a freelancer for company publications. He would never again work for someone else on a full-time basis. Barrett was an early aviator and wrote frequently about World War I planes and pilots. His earliest writings were mostly short stories in pulp fiction aviation and detective magazines, using his own or a pen name. He worked for more than four years on his first book, a biography of Paraguayan President Francisco Lopez and his mistress Eliza Lynch. Published in 1938, The Lady on Horseback established Barrett as a serious writer. Soon after publishing his book, the Barrett’s returned to Denver, in 1939, where he was named aeronautical consultant to the Denver Public Library. He continued to write for a variety of platforms including dozens of speeches for Missouri Governor Lloyd Stark between 1939 and 1941. He also published his second book, Flight From Youth, in 1939. Capitalizing on his aeronautical background and the extensive research he had done on World War I planes and pilots, he became a civilian lecturer for the Army Air Corps during the Second World War, and had a weekly radio program, Speaking of Wings, on Denver radio station KLZ. Following World War II, Barrett had great success publishing three books; The Last Man, The Evil Heart and The Number of My Days. He continued to sell short stories and novels to magazines and book publishers. The Left Hand of God, published in 1951, was one of his most popular books. In 1955, it was made into a movie starring Humphrey Bogart. Despite many other books and articles published, Barrett was most often referred to as the author of The Left Hand of God until a story he had written nearly three years earlier was published by Doubleday in 1962. Lilies of the Field was an immediate success and became a motion picture before Barrett had even agreed to sell the rights. The simple story of a traveling army veteran answering the prayers of five nuns in the southwest desert won a best actor Oscar for Sidney Poitier, earned many awards and nominations for Barrett and became the work most often used to identify this Denver author. In 1964, Barrett was selected to write a biography, Shepherd of Mankind, documenting the life of Giovanni Battista Enrico Antonio Maria Montini, Pope Paul VI. His writing frequently had a religious theme, due to his Catholic faith. His writing explored many contemporary issues including celibacy and the priesthood with The Wine and the Music, which was made into the movie Pieces of Dreams. One of the books he felt accomplished about was The Lady of the Lotus, (1975) which explored the Eastern religion he had come to hold in high regard. It was also his last major work. Barrett published his last work in a 1984 issue of The Saturday Evening Post. Christine, his wife of more than 57 years was also an author. “Bunny” traveled with, and was a part of everything Barrett did. She died in 1982. William E. Barrett died at his home in Denver, Colorado on September 15, 1986. He was survived by his two children, William E. Barrett Jr. and Marjorie E. Barrett. The Penrose Library at The University of Denver maintains a collection of Barrett’s papers arranged by Manuscripts, 1938-1975; Short Stories and Novelettes, 1926-1966; Book Reviews Written by Barrett, 1940-1966; and Correspondence, 1934-1968.